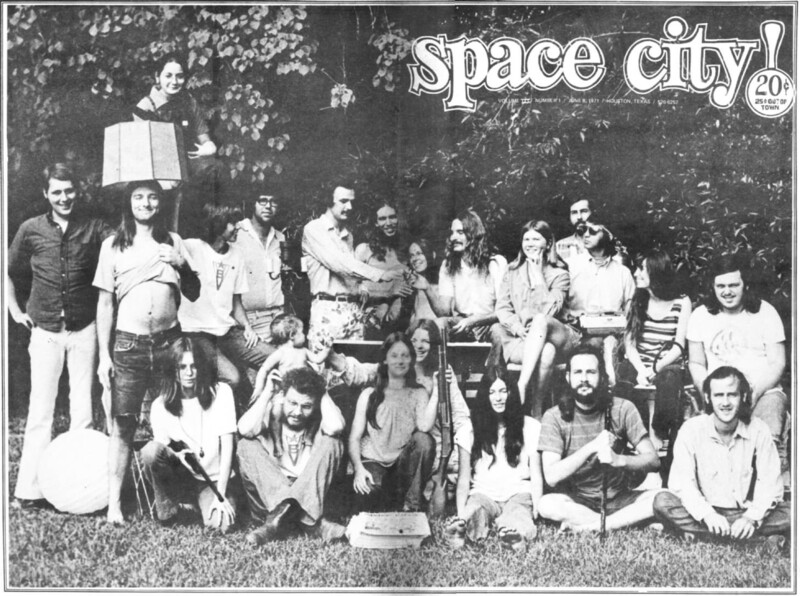 The staff of Space City!, Houston's late '60s-early '70s underground newspaper. 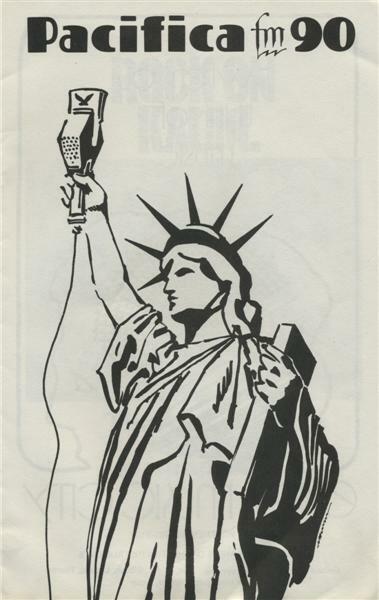 Cover photo -- from the paper's June 8, 1971, issue -- by Jerry Sebesta. Image from Wikimedia Commons. Houston may not have had a center, but it certainly had a heart. Montrose, still one of the great neighborhoods of the world, and long a haven for artists, homosexuals, and iconoclasts, became a bohemian mecca in the Sixties. Houston was a fairly unlikely Sixties hotbed. A sprawling adolescent boomtown, the city had no real center and little sense of actual community (unless you were River Oaks old money and/or in the oil bidness). Austin, on the other hand, had long been a focus for literate and iconoclastic traditions and populist/left activism, geographically and culturally tied to the campus of the University of Texas. Austin was a major point of origin for the massive student rebellion against the War in Vietnam, for the psychedelic music phenomenon, and for the underground press and comix movements. Austin, too, was très cool; it was beautiful and progressive and everyone in Texas who was born with the weird gene wanted to head for the hills of Central Texas. But by the late 1960’s/early ‘70s, Houston was really where it was happening in the Texas counterculture. There were several factors that played into this transformation (including an “us-versus-them” attitude that made for a strong and cohesive community). First, lots of important music talent grew out of or was nurtured in Houston and East Texas, and Houston had a vital, organic club scene that provided outlets for that talent. Mike Condray, George Banks, and the Jubilee Hall-Family Hand-Liberty Hall continuum of clubs played an especially critical role in showcasing cutting edge roots-music talent from the region and around the country, and Anderson Fair -- which from its inception served as an organizing site for progressive politics -- would become one of the nation’s most important acoustic venues. Although I first saw Janis Joplin in Austin -- at the UT student union’s weekly folksinging circle -- it was Houston’s Jubilee Hall that initiated me into the transformative experience that was the Thirteenth Floor Elevators; Liberty Hall where I first saw Lightnin’ Hopkins and Bruce Springsteen; and Anderson Fair where I discovered Townes Van Zandt, Guy Clark, and a raft of progressive folkies. 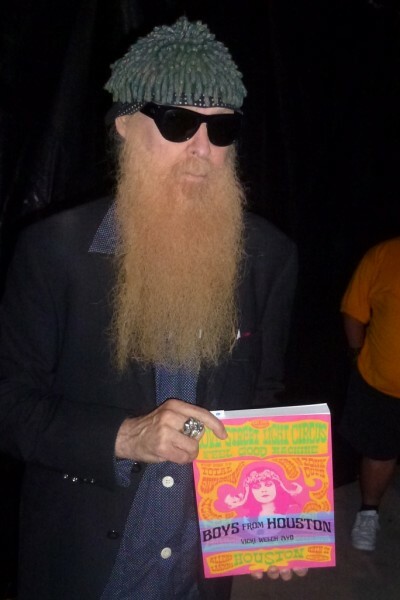 The Old Quarter was a pioneering acoustic venue, and David Adickes’ Love Street Light Circus held court to the psychedelic crowd and the likes of Bubble Puppy, Fever Tree, and Billy Gibbons’ Moving Sidewalks. Of Our Own brought in Phil Ochs and the MC5. These weren’t just places to go hear music. They were an integral part of the scene; there was little separation between them and the community they served. Second, Houston may not have had a center, but it certainly had a heart. Montrose, still one of the great neighborhoods of the world, and long a haven for artists, homosexuals, and iconoclasts, became a bohemian mecca in the Sixties, with a sense of community and a tolerance for diversity that were unique in the city. It was an eclectic mix of elegant old houses and ramshackle apartment complexes, head shops and boutiques, strip clubs and burger joints, lively music venues and gay bars. There were galleries, museums, and folk art sites, hippie communes and esoteric enterprises like the Pagan Church, plus a Greenwich Village-type strip of bars and bistros with European fare. There were always block parties and outdoor concerts and guerrilla theater actions and anti-war demonstrations -- and longhairs, dude, abode! And, if you really looked, you could find a place to live for well under $100 a month. With indoor plumbing! Finally, and perhaps most important, was the role of underground newspaper Space City! 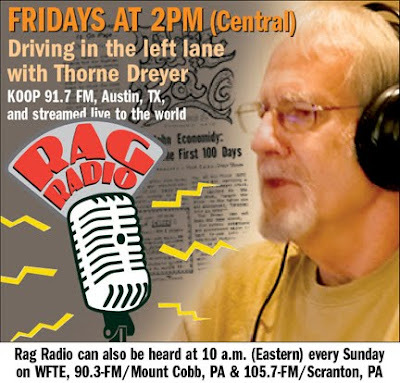 -- with a significant assist from Pacifica radio station KPFT -- in spreading the word and creating an environment where the counterculture could thrive. Space City! (originally Space City News) helped to pull together “pockets of resistance” throughout the massive metropolitan area, provided otherwise-isolated hipsters with a sense of belonging, and was a primary source of information about community activities. In the community-at-large, Space City! 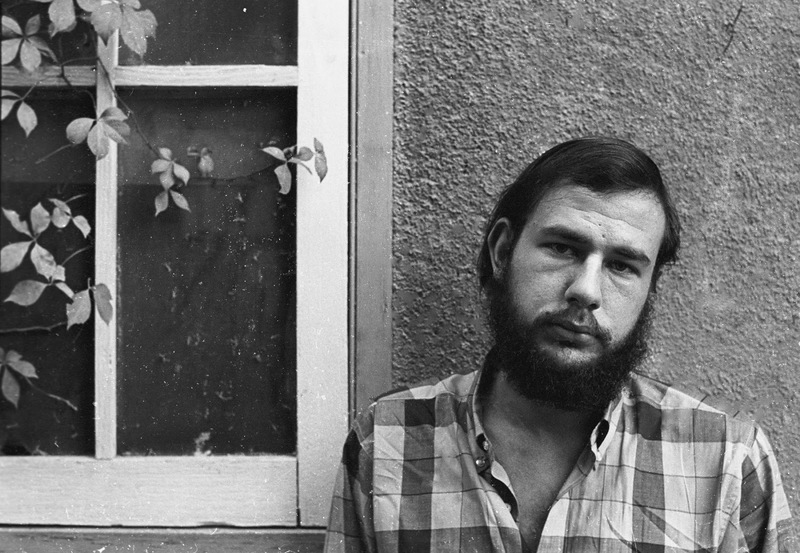 became the face of Houston’s thriving counterculture, as hundreds of young kids peddled the newspaper throughout the city -- at the corner of Montrose and Westheimer, on the University of Houston campus, at Hippie Hill in Hermann Park, and downtown at Market Square and Allen’s Landing. Not only did the offices of Space City! serve as a de facto community center, but the paper also spun off a number of auxiliary counterculture institutions, including a drug crisis center, a food coop, several high school underground newspapers, and a community-run nonprofit rock ‘n roll hall, Of Our Own. Also playing a key role in making Houston a happening place were noted painter Margaret Webb Dreyer, a peace activist and a prime mover in the Houston art scene, and her journalist husband, Martin. (Full disclosure: they also doubled as my parents.) Their Dreyer Galleries had, since the 50’s, been a gathering spot for Houston’s arts, literary, and academic types -- and liberal politicos like Houston’s young progressive mayor, Fred Hofheinz -- and now it became a center for the burgeoning peace movement. Thorne Dreyer in the mid-Sixties. Photo by Robert Simmons. Image from Vicki Welch Ayo's Boys From Houston. Houston was also home to an active -- and actively violent -- chapter of the Knights of the Ku Klux Klan. (It would later be revealed that the KKK had built a strong and abiding presence inside the Houston police department.) The Klan targeted the Houston counterculture, with most of the city’s peace organizations feeling its wrath. Klansmen shot bullets through the front door of Dreyer Galleries after throwing yellow paint on the front wall of the converted old house on San Jacinto. The offices of Space City! were bombed and some of the paper’s advertisers were threatened and their shops riddled with bullets. Pacifica radio was twice bombed off the air by right wing nightriders. Ironically, the work of the KKK scared nobody off, and if anything, the violent acts just seemed to strengthen the commitment of the peace activists and counterculture denizens -- and made the radical community even more cohesive and purposed. To say nothing of providing a lot of free publicity! Also see "Vicki Welch Ayo's 'Boys From Houston' Documents a Thriving '60s Music Scene," by Ivan Koop Kuper in The Rag Blog.